The Stranahan’s Colorado Whiskey is aged for at least two years in new charred Oak barrels and then watered down with the water from Eldorado spring. The Whiskey itself is a blend of 2, 3 and 5 year old Whiskeys. This “Single Malt” is one of the first 100% malted Barley Whiskeys made in US out there! 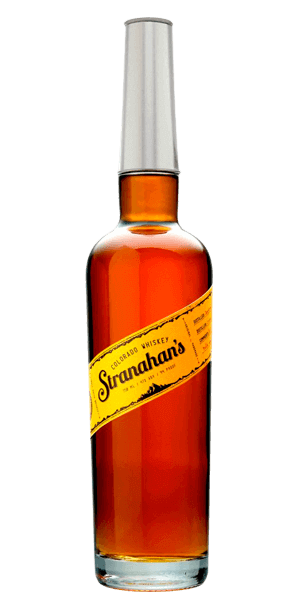 What does Stranahan's Colorado Whiskey taste like? The Flavor Spiral™ shows the most common flavors that you'll taste in Stranahan's Colorado Whiskey and gives you a chance to have a taste of it before actually tasting it. Strong and rich aroma of pepper, spices, roasted nuts and ripe citrus fruits. Hints of caramel, honey, tobacco and maple syrup with leather like taste. A strong and audacious finish just like it should be for such young and fierce Whiskeys in the mix. Smooth, malty, and balanced - a superb American Single Malt. Standing among peers such as Westward Single Malt, this one is my favorite. Boring and not very smooth. Feel like it used to be a lot better back in college. Nose of banana and caramel, taste is more woody/oak with vanilla and caramel notes. Finish is long with medium burn. One of my go-to bourbons. Dang good whiskey for Colorado! Fiery finish, strong vanilla and caramel notes. Black Label (Diamond Peak) is so much better in all areas mainly because it is 2 years older. Good, solid small distillery whiskey. Very drinkable neat with unique flavor. Outstanding sipping whiskey, very impressed. I love this! The yellow labels can vary greatly as they break open 20 barrels and mix at a time to make a batch. Sometimes it might have more 3 year barrels making it a little spicier, sometimes more 4 or 5 year barrels and it is a little smoother. I have had about 8 or so bottles, each one from different batches, and each one slightly different. They are always smooth, and make some of the best Manhattans, or Old Fashioned I have had. I think it has lost something a few years back. It was right around the time they sold and moved the distillery. Do not get me wrong it is still a good whiskey, but it was not as worth it at the higher price point, but I have seen the prices come down and now it is more in line. Great taste! Wasn’t what I was expecting from this but definitely think about getting another bottle every time I drink it. I love single malt scotch... I love bourbon... I didn't care for this one... I was really excited to try it and I'm pissed I wasted $60 on it. I love the blend of oak, vanilla and caramel flavors from my last bottle (#16), produced just before their flagship product was for sale. I hate the cliche - "smooth", but this is really, fine whiskey. As Flaviar states: "...one of the first 100% malted Barley Whiskeys made in USA out there! " I completely agree. The Black label is even better. Slightly too sweet and malty for me. Definitely picked up on the taste of leather. Drank neat but feel like I‎t would be better on the rocks. Very smooth malt whiskey with a sweet initial taste and very slight burn. Great served up or neat. Single barrel. Smooth on the nose. Candy on the tongue, slight burn on the throat. Would drink neat. I was able to enjoy a bottle of Stranahan's Colorado Whiskey Single Barrel Select, 2017. it had an outstanding, creamy, birth of barley & spice; a life of toffee, caramel & vanilla that linger on to a long death. One of the finest whiskey's I have ever had ever found. Over ice only, it would be sacreligous to mix...add only a touch of water if you can't drink straight up! Hands down, all time favorite. This whiskey is dear to my heart being from Colorado. It is a pure malted bliss that is smooth and sweet. Rich caramel with a palate soothing leathery finish. Neat, on the rocks, or mixed - fantastic! Solid offering, but the mushroomy funk can be a turn off this time of year. I'll revisit in the fall/winter.